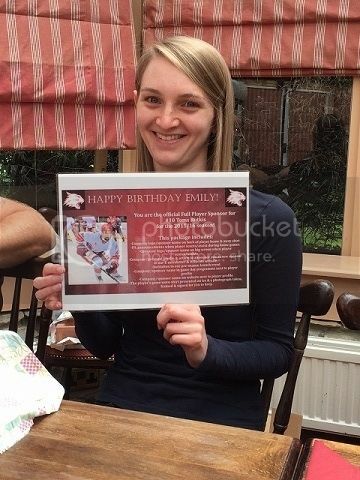 Hockey mad Emily Tudgay will have a year to remember during 2015-16, after boyfriend Mark Seager helped her celebrate this year’s Birthday with a Full Player sponsorship package of her favourite Wildcats player, Toms Rutkis. Speaking to swindonwildcats.com after the sponsorship was taken out, Mark told us how the idea came about. “After watching Toms contribute to OHA's victory at the 2014-15 playoff finals in Coventry, Emily decided that she wanted his name on her jersey for the following season should he sign for Wildcats. “After he did, I thought why not go the whole way and get Emily's name on his jersey?! The teenage star signed a one year deal with the Wildcats back in April after making 21 appearances for the side last season and scoring 4 goals and making 8 assists and speaking after receiving her surprise gift, Emily said: “This was a huge surprise and I am so excited to be sponsoring Toms for the 2015-16 season. “As if I wasn't looking forward to September already! Good luck Toms! “Let's go Wildcats! Let's go Wild!" Concluding, Wildcats Marketing Manager Sally Price said: “This was a fantastic gesture from Mark and Emily’s parents, Martin and Janet and everyone at the Wildcats are thrilled that Emily enjoyed her surprise! “It’s the first time since I’ve been involved in the club that something like this has been done so it was a really great gesture by Mark. Toms roster page has been updated.